Nanoparticles (in red) being taken up in the brain of a live rat model with glioblastoma (in green). By making nanoparticles bioadhesive, or "sticky," the researchers have answered a long-standing question: Once you get the particles to the brain, how do you get them to interact with the cancer cells there? Their findings are published May 19 in Nature Communications. "Until now, research has focused on whether you can load the nanoparticles with drugs and whether we can get them into the brain at all, without thinking too much about what cells they go to," said senior author W. Mark Saltzman, the Goizueta Foundation Professor of Chemical and Biomedical Engineering, professor of cellular and molecular physiology, and member of the Yale Cancer Center. "This is the first exploration of the particles' affinity for different cells." The ability for nanoparticles to deliver drugs to specific areas of the body holds great promise for fighting cancer and other diseases while minimizing the side effects of drugs that are often very toxic, according to scientists. Their use in treating brain cancer, though, has been particularly challenging. That's partly due to the blood-brain barrier, which acts to keep foreign elements out of the brain. Researchers have been able to get nanoparticles to penetrate the brain in recent years with help from a polymer coating that gives the particles "stealth" properties, allowing the particles to hide from the body's immune system. Those same stealth properties, however, also keep cells from recognizing the particles. "So they're just kind of in the space between the cells, and not really doing what they're supposed to be doing," said co-lead author Eric Song, a graduate student at the Yale School of Medicine. The Yale researchers found that they could correct for this by altering the chemistry of the nanoparticles. 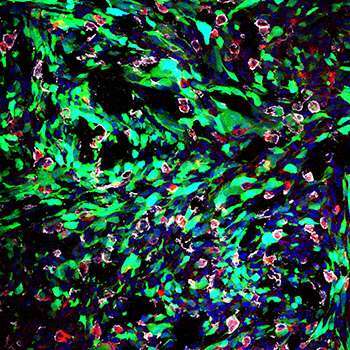 In two groups of rats—ones with brain tumors and ones with healthy brains—the researchers found that differences in the particles' surface chemistry played a significant role in whether the particles were internalized by cells in the brain. They covered one group of particles with polymers rich in aldehydes, which chemically bind to amines—a compound found in most proteins. These bioadhesive particles were most likely to be taken up by cells of all types in the brain: Tumor cells were among those that internalized the bioadhesive particles at a particularly high rate. These results suggest that tailoring the chemical properties of particles provides an opportunity to control the distribution of the drugs they're carrying, said the researchers. Further, they believe that the particles could be tailored for specific therapies to improve efficacy in target cells, and minimize toxicity to the cells they're not targeting.